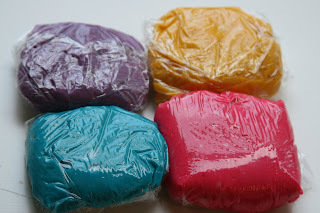 A few months ago, I saw this idea for "play dough cookies" on a couple of friends blogs(Natalie and Emily, thanks for the idea!). The original recipe is from Allrecipes.com. 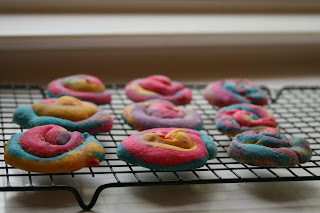 You basically make a sugar cookie type of dough, divide it into four, color each a different color, grab a little of each color and form into a ball, then you roll the dough between your hands to make a long snake, then twist it into a swirly cookie. Its really cute! I finally busted out the recipe out this week. After I had already told the kids we were going to make them, I realized I didn't have enough butter(oops!) so I ended up making do with what I had. This caused a slight problem seeing as that you have to roll the cookie dough and the consistency of my dough wasn't right. It kept sticking to our hands and just making a mess. I added more flour and eventually it kinda worked, but they still didn't turn out half as cute as everyone elses on their blogs. They kept falling apart. Oh well, we tried- and it was fun! The kids thought they were awesome! what do you mean by "crazy"? you're crazy. That's so cool. I love the idea of putting sticks on them to look like lollipops. The expressions on the girls faces are priceless. I like how the colors stayed the same when I tried the color thing once I think I overcooked the cookies because they were more brown yours look really good. Would look great in a Wizard of Oz kitchen I think. Good job everyone. Those are precious pics of your girls. Hope your husband's got a shotgun. ;o) And the cookies look yum, too. That's so cute! It looks great! What a cute idea. Can I use any sugar cookie recipe to make them. I know my grandkids would have fun. 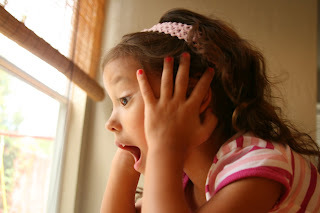 Aubrey and Ella are soooooo soooo cute in the pictures you posted. Give them a hug from me. Thanks for your sweet email.... you are SO GOOD to me. I'm not really down.... just being DUMB!! I love the pictures of the girls faces. So cute! My boys had a fun time making these cookies. Next time I am going to try making them with my sugar cookie recipe. CONGRATS on your good baby news! I am so excited for you! What a fantastic idea! Lucky kids! 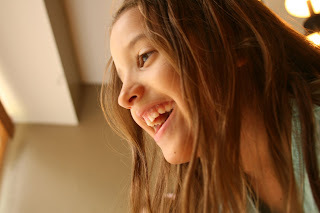 Your pictures are adorable! Oh, yumm!! These look fabulous. very fun! we are going to have to try them. What a fun activity. I may have to try that sometime. Those look pretty good. I'm impressed! 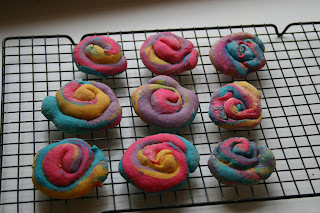 Haha, they look like fake play-dough cookies! You are the funnest mom ever!